It’s a great pleasure for us to announce that medialab, our own historical server, is back online, and can be reached again via SSH at medialab.freaknet.org (login: luther pw: luther). Medialab was created in Catania in 1997/98 within the CSOA “Auro” squat; it provided UNIX accounts and email boxes to anybody asking for it. Since then, it has been online 24/7. Due to some financial issues, we recently had to discontinue our DSL contract, so medialab remained down for about 7 months. Thanks to Sirius Technology, who sponsored a DSL line for two years, medialab is finally back online. The old Compaq Deskpro had started showing some hardware issues, so we decided to “upgrade” the system without using anything produced after 2003: no software installed on medialab or hardware used in medialab is more recent than that. 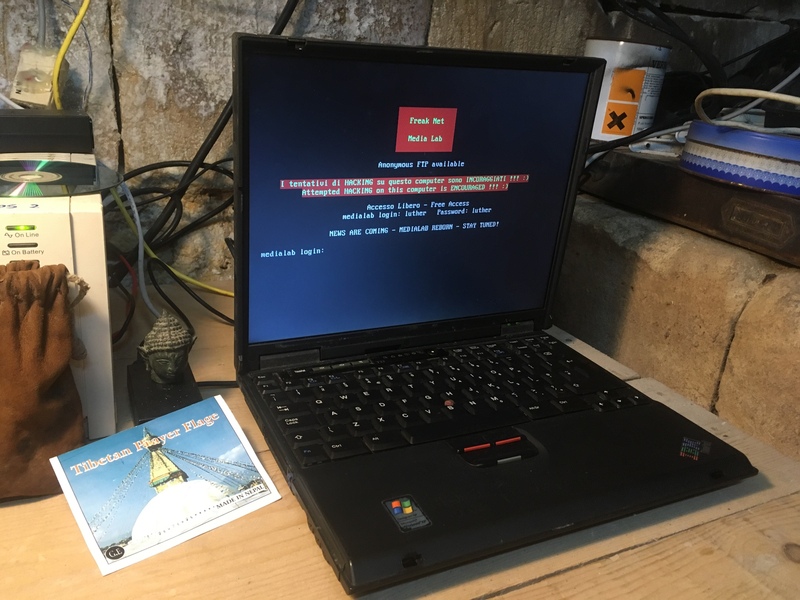 Now medialab runs on a Thinkpad T23, its kernel has been upgraded from 2.2.19 to 2.4.37 (so we can use USB drives) and a few tools have been updated (to 2003!). Among other things, the Anatolia MUD server is back online as well (telnet medialab.freaknet.org 6001 to play), of which we recovered the old backups with all the original characters (so if you still remember your password you can restart playing exactly where you left years ago 🙂 ). Due to the increasingly large number of dumbasses around the Internet, we unfortunately had to forbid telnet access and allow only SSH. It is really unbelievable to see so many portscans and break-in attempts despite the issue.net clearly says that access to the machine is free (quoting username and password for luther…).